A resource for parents with cancer and the family and friends who love them. 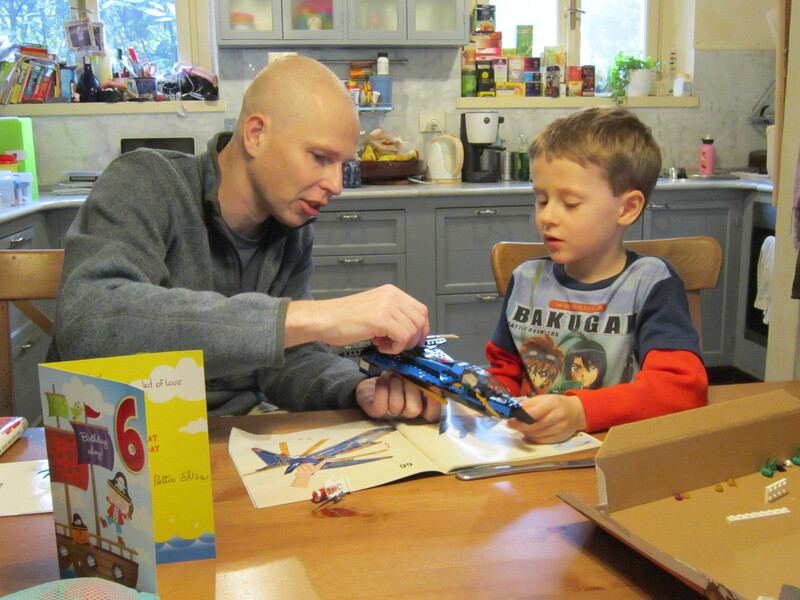 Parenting with Cancer: What’s the first thing you thought of when Richard was diagnosed? Richard Choularton: I had no idea what to think, what it meant from my family or for me. I thought I’d better educate myself fast. I read the Johns Hopkins Patients’ Guide to Lymphoma in the emergency room waiting for someone to explain what was happening. As I read more and more, I started to understand how serious it was and I started to understand that I had cancer. Sarah Choularton: I was overwhelmed. We were with the kids, in a hospital getting CAT scan results, thinking that Richard had pneumonia. The kids were hungry, we had been waiting for hours, Richard was getting progressively worse and worse, not able to stay conscious. Finally Richard went to the window to find out what was going on, and the doctor told him. Richard came out to get me with tears in his eyes, and the doctor broke the news in front of the kids (they didn’t understand, thankfully). I will never forget….Richard turned to me and asked, “Is Lymphoma cancer? Do I have cancer?”….I said yes. It was all a blur from there….a mix of Italian (which we didn’t speak very well then) and English….the doctor saying we had to rush to the emergency room and me trying to figure out what to do with the kids. PWC: How did you tell the kids you had cancer? RC: We were very open with our kids. They had spent two weeks helping to look after me as the severe symptoms of my cancer began to set in, and they were with us at the hospital when I had my CT scan. They didn’t understand what the doctor was saying, but they understood from my reaction and my wife Sarah’s reaction that something was wrong. Sarah came up with great ways of explaining what was going on. We had read a book about bacteria and they knew about Mr. Yuck. Mr. Yuck became lymphoma, a broken white blood soldier that had made a big ball of yuckiness in Daddy’s chest. Chemotherapy became big medicine that kills Mr. Yuck. The gallons of water I had to drink became Daddy’s Anti-Lymphoma Juice. Once we got to radiation therapy, we explained that the ball of Mr. Yuck was still there, but much smaller and needed to be zapped. I drew a picture of myself with a tumor in my chest, next to a big radiation gun, which shot the tumor. My son explained radiation therapy to his teacher the next day! SC: When we didn’t know, we’d tell them we didn’t know, but that we loved them, and we were all doing our best to get Daddy better. They came to the hospital to visit when they could, and then would bring Daddy water and food when he was at home. One day, after Richard’s immune system had improved, Izzy had a play date with a friend that didn’t know what was wrong with Richard. I overheard Izzy explaining to her friend, very matter of factly, that her daddy has lymphoma, what it is and how he will be getting better with the help of the family and doctors. It was amazing! I would recommend reading “When a Parent has Cancer: A Guide to Caring for your Children” by Wendy Schlessel Harpham, which is a quick read and has wonderful hints. PWC: What’s the best thing someone did for you or your family to help during cancer? RC: My wife, Sarah, has been amazing throughout. I can’t begin to list the things she did to take care of me, take care of the kids, and keep the family together. She taught me a long time ago that it doesn’t come down to one thing, what is most important are the many small things. Our friends and family were also amazing. My mum and our best friend both dropped what they were doing and came to Rome from the UK and the US to help look after us. As we do not have family in Rome, this was so important. It allowed Sarah to maintain more normalcy for the kids, while doing all the things that you have to do to look after a cancer patient. SC: My best friend from Peace Corps put her dissertation on hold and came all the way from California to Rome to live with us and help out for 6 months. 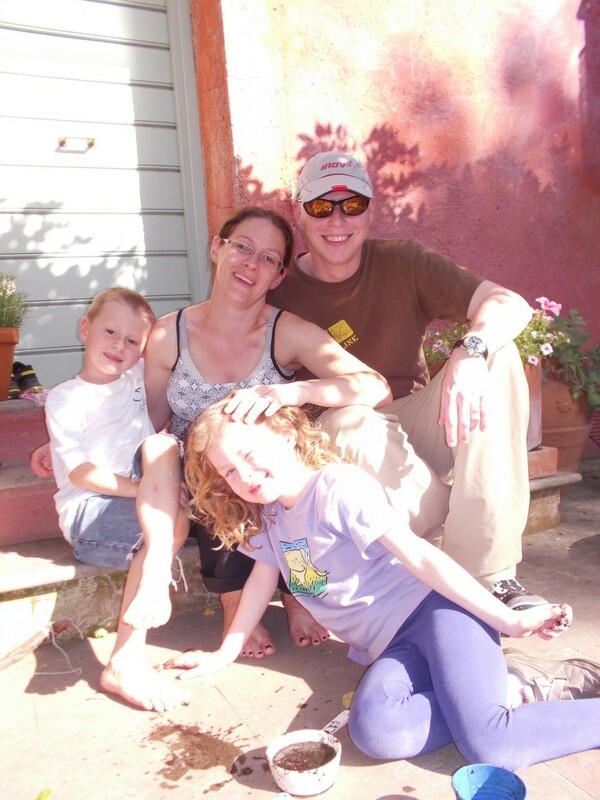 Since we were living in Rome for Richard’s job, we were in a bit of a bind….Richard also couldn’t travel at the beginning, as the lymphoma had caused a large mass in his chest, causing liquid build up around his heart and lungs. Our families were far away, and we had only been here for a couple of years….so, the help was invaluable. We are blessed. PWC: What’s the best thing someone said to you when you had cancer? RC: “We can beat this.” I didn’t doubt that I would be able to fight the cancer, but the statistics aren’t really great for Stage 4B Non-Hodgkin’s Lymphoma. But my doctors were very positive from the outset. This really reinforced my normal optimistic outlook and helped me focus on getting better. SC: Honestly, not much as I hadn’t really spoken to many people about it until I started therapy. My friend who stayed with us would remind me on bad days “its worse for the person with cancer”, and that helped! PWC: What piece of advice would you give a parent who was just diagnosed? RC: When I was diagnosed, I was no longer able to do everything I did before as a parent or as a partner. This was especially difficult after I came home from the hospital. As I went through treatment, I had good and bad days – days where I want to cook dinner or play on the floor with the kids, and days when I couldn’t. Sarah did an amazing job in explaining to the kids what was happening and having them help as caregivers. They would bring me water, make me cards, and check on me all the time. We tried hard to let them know how I was feeling so they understood why I couldn’t play or help with homework and when I could. It wasn’t always easy to manage the kid’s expectations of what I could and couldn’t do, but by talking about it all the time, we managed to find a great balance. PWC: What piece of advice would you give a parent who is taking care of someone who was just diagnosed? PWC: Wig, headscarf or bare-naked head? PWC: What’s been the hardest part about having cancer and cancer treatments? RC: At times, I felt like cancer was preventing me from being part of my family. Whether because of fatigue or a compromised immune system, not being able to engage with your children, your spouse, and your friends in the same way you used to can be very difficult. I tried hard to do small things like getting out of bed to have breakfast with the kids before they left for school, and having dinner with the family every night. SC: Not being able to do anything to comfort my husband, staying strong for him and the kids, and some days just making it through the day. PWC: What has helped your kids through this tough time? RC: I think the most important thing has been being open and honest with the kids and trying to explain things in ways they can understand. Sarah was also really good about helping them be part of the team to look after me, whether by bringing me food, making cards, or reading to me. Normally we read a story every night to the kids. When I was too sick to put the kids to bed, my daughter would bring one of her schoolbooks into my bedroom, sit next to my bed and read to me instead. She felt like she was doing something to help – and she was. After I finished radiation therapy, we went away for an amazing week in the mountains to a place we know and loved. We drove to Mont Blanc, took it easy, went for walks in the woods, eat good food, and just relaxed. It was a time when we could just be together without any of the stress of work, school, or life at home. We planned to return next year and looked to the future. It was the best vacation we’ve ever had! SC: To be honest, I have no idea! I tried to keep things somewhat “normal”, and we were lucky that the kid’s schedules weren’t terribly altered, which I think helped. Also, I think being open with them, keeping them informed and letting them participate as appropriate helped. We have family meetings in which they can talk about whatever they want, which they like as well. The other night Richard, my husband, asked the kids what helped them. It was interesting: They said the vacation we just took and spending time with us. I would agree that giving them individual time in which they get undivided attention by either my husband or me helps them. Time with the family focusing on the kids and being a family, regardless of where this takes place, has been important to us. PWC: What keeps you awake at night? RC: Lumbar punctures, bone marrow biopsies, and steroids! SC: The thought that Richard won’t make it and what happens when I get sick and can’t keep caring for the family. PWC: How do you feel when someone calls you an “inspiration”? RC: To me, my wife and the doctors and nurses who have gotten me this far are the real inspiration. I remind people of this whenever someone calls me an inspiration. SC: Typically, I shy away from these types of compliments, saying something to the effect of “Well, we all do what we have to do to get through,” as this is how I feel. We are all inspired by different things, and if one person gets through their hard day thinking of our family, that would be great. 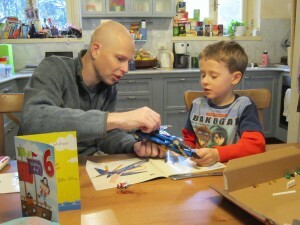 PWC: What is the hardest part about being a caregiver of a cancer patient, especially with kids? SC: Staying strong, keeping things positive, and remembering that this is the only childhood the kids have. Some days being able to celebrate the small things is a challenge, yet so important for the kids. PWC: What’s your favorite place to go for emotional support on your darkest days? RC: Simple. A hug from my wife and kids! PWC: Which online resources do you recommend parents with cancer go for information, support and sanity? RC: CaringBridge.org has been an amazing tool. Sarah started a blog to update all our friends and family and wrote on it every day during my initial treatment and then every few days once we settled into the long haul. It was great for two main reasons: First, it allowed us an easy way to keep lots of people up to date with what was happening and reduced the need for a hundred phone calls and emails every day. Second, people were able to leave messages of support. Especially when I was in the hospital, these messages were always a big boost to me, to Sarah and to my family. It was amazing to know so many people were following my progress and sending their love. PWC: If you could change one thing about your cancer experience (besides the diagnosis), what would it be? SC: While my husband might disagree, I wish we had been in the US, as much would have been easier from a cultural and language perspective. I think the support would have been more robust as well. Yet, the doctors have been great here, and the treatment good…our Italian has definitely improved. Thank you for sharing your life of these past few months. Despite what you say, you are an inspiration. Having the strength to live your life to the fullest despite a severe illness, getting through the fear day by day and most importantly loving each other is a commendable success. Best wishes and many blessings to you four. Sarah and Richard have always been an amazing couple, and we feel that Richard is a son to us, not merely a son-in-law. It was partly a revelation to read this account even though I thought that we had a handle on how they were coping. My father was diagnosed with colon cancer when I was in high school, and my mother handled the entire situation completely opposite than Sarah and Richard did. All the feelings of helplessness and fright came back to me when I heard Richard’s diagnosis. I’m thankful that they included the twins so thoroughly in every step and made them feel as if the situation was a family one. As I say each time, I love you all very, very much! Thank you both so much for sharing, for you honesty and love for each other. Your love inspires me. I love you and think about you all the time. Thank you. richard is my son and sarah my daughter. such are families built on love. Created by Jen Singer, Lymphoma Survivor and Mother of Two. What’s on Your F-It List? 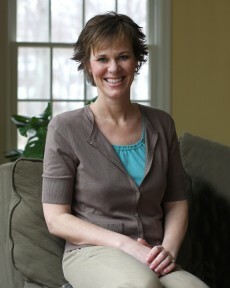 Disclaimer: The information on ParentingWithCancer.com is not intended to be a substitute for professional medical advice or to replace your relationship with a physician. For all medical concerns, you should always consult your doctor. Copyright © 2019, Jen Singer & Parenting with Cancer. All Rights Reserved. Design by Ron S. Doyle at Waterday Media, powered by WordPress and Prototype.